Actual total tire width will vary slightly depending on rim width. That's a nice, simple method for rough calculation, but if fails to take in manufacturing variations such as mold construction, bead design, seam dimensions, etc., all of which vary depending on tire type, design, style, etc., and which also vary from one tire maker to the next. All these things make precise math impossible. There are variations in even the same tire by the same maker in different size classes. So simple math is not accurate, and neither is what is published precisely accurate. But I generally go with what is published. The information used to generate that data is more comprehensive and probably closer to reality and closer to mfr. specs. Heck, when I buy a new set of tires, I want a set from the same batch, with matching dates. Mathematically, the 245/55/18 is slightly shorter (about 1/2") than the stock 235/60/18 and will skew the speedo slightly. A 255/55/18 is virtually identical in height to stock but slightly wider. It's the tire overall height/diameter that affects the speedo, width will not affect the speedo. A taller tire will place more load on the drivetrain. Kinda like riding a 10 speed bike, your legs feel the increased load of a higher (taller) gear. than you for the kind feedback. 255/55/18 tires maybe in my future. Your stock 235/60/R18 tire shows to have a 30" diameter on the Discount Tire website. 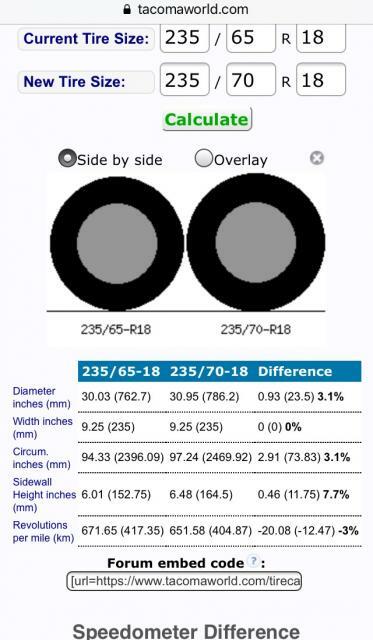 The 245/55/R18 has a diameter of 29". The 245/60/R18 would keep the 30" diameter (same as stock) and not cause any changes, though they would be slightly heavier as well as wider. Going with the smaller diameter tires would cause your speedometer to read slightly higher than actual, and give your engine a slight advantage in leverage/power, but only by a very small amount, and you would have an equally small percentage drop in fuel mileage. The smaller tires would likely be slightly lighter in weight, which could help offset the drop in fuel mileage. Any visual or appearance change would likely be unnoticeable. I see no advantage, so I'd go with the 30" diameter tires to keep all other aspects stock, and likely have no effect on the computer. Class......it's simple, 2+2 always equals 4, and mathematics is very precise, even when some try to tell you otherwise. We are talking passenger car/light truck tires..........not tires for tractor/trailer big rigs with 18 wheels/tires. Doing the simple, but accurate math, to determine passenger car tire height and width is a lot easier, or should I say simpler, than running around various tire stores with a tape measurer and measuring various metric size tires. My Stanley carpenter's tape just verified the 235/60/18 tires on our CRV are 29" tall, not 30". Mathematically close enough for me. Last edited by crv383; 03-31-2019 at 09:23 AM. TIRES AT 18000 MILES ( 4/32 tread left - tires rotated and balanced every 6 months )- JUST TERRIBLE WEAR - NEED TO REPLACE THESE PIECE O' ****! curious, why do you balance your tires twice a year? Last edited by BBLee; 04-01-2019 at 03:50 PM. Agree with bobinpa that tire manufacturer's revolutions per mile is the way to compare tires. We significantly changed the tire sizes (all six) on our motorhome. Using the software on the truck shop's laptop plugged into the engine port just like on all cars. The speedometer/odometer was re-calibrated to the revolutions per mile of the nearly 4" taller tires. Of course we did research first with Cummins and Allison for their OK, and mounted the tires to ensure there was no problem. I am guessing the same could be accomplished for your CRV. Good luck! I did make an error - that tire was 29" and not 30" - so I went back and corrected the post - thanks, Rocky and crv383! I dropped down a size to 235/55/18 when I switched to high performance summer tires. (The Firestone Indy Hawk 500's weren't available in 60) The speedo is slightly off which is the only downside. Nothing else was affected. I find the CVT to be slightly under-geared anyway - so the tiny change in gear ratio feels like a plus. …..
For my Tow Vehicle, I installed smaller size rubber (on same rims) as well. Went from 225/65/17 down to 225/60/17 - which is a 3.2% change. A few "arm chair" auto mechanics experts got their nylons in a knot over my findings. But from my view, using a smaller size tire worked great on my tow vehicle. And even when NOT towing, my vehicle gets better MPGs - due to less lugging and down shifting. Last edited by newbie99; 04-02-2019 at 08:16 AM. The armchair guys don't get each vehicle.is different. It's not the downsizing in tires overall that mattered. It's that you downsized on a vehicle that was in need of it. And it's not just tire size. Brand, weight, rolling resistance and so on all play a part. Guessing you likely upgraded tires as well as went down a size, which your V likes better of course. Your right in it's also a gearing issue. You run down the highway for a long distance that benefit will likely decrease, but head wind versus tail wind will matter more than a little tire size change. Really want to give it a boost. Get nice and light weight aftermarket rims. Gains will go up even more especially in the MPG department. Glad to hear they only lasted 18,000 miles although with my driving that will still be 4 more years. I will be happy to see the end of them too. How does using synthetic oil affect the oil change schedule? oil change, cabin filter change, air intake filter change. if i change ECU/Computer do i need to have it flashed by dealer or plug & play? 2003 Spare Tire: What's the largest size tire I can mount?